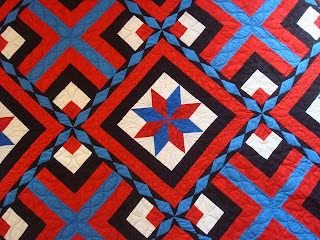 QuiltinGal Barbara H. Cline: "Yankee Doodle""
Here is my block in the quilt "Yankee Doodle". This entire quilt uses only one block. This is the block that is featured in Quiltmaker 100 Blocks magazine. Can you find the block? Here is the block out lined in yellow. 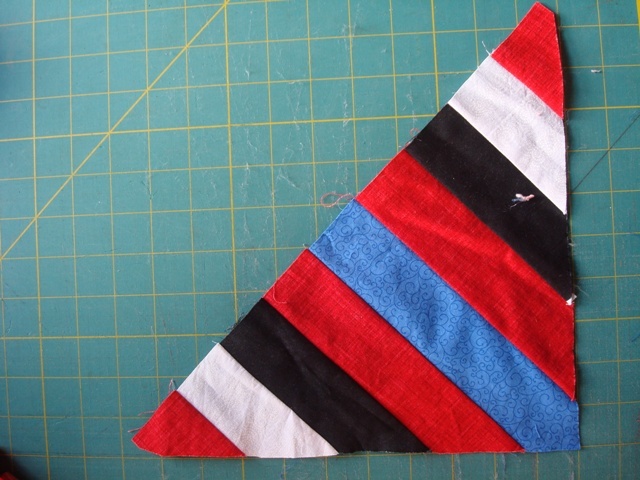 Create a triangle using strips of fabric. 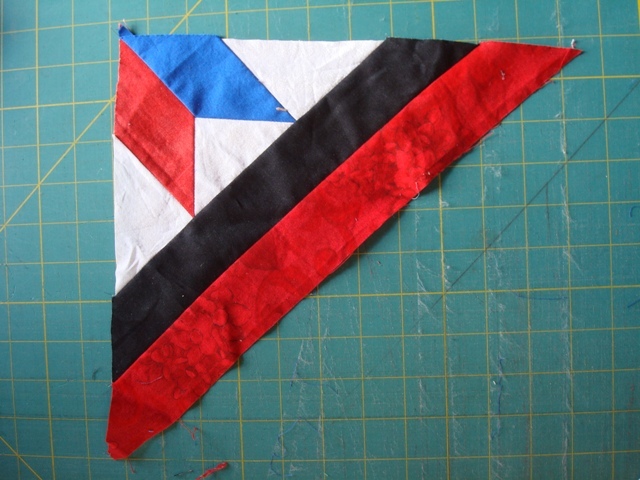 Create another triangle with two strips and two diamonds. Make a diamond chain and place it between the two triangle units. Follow the 100 Blocks Blog Tour daily April 30-May 4 at The Quiltmaker Blog Quilty Pleasures for inspiration, ideas and giveaways galore! To win a free Quilt Maker 100 Blocks magazine leave a comment on my blog. Barbara I love the table runner version! I've thought about you a lot this weekend knowing you are traveling up North to see your sweet granddaughter! ... and sweet daughter! I love your block and makes such a great quilt. How wonderful that you had it published in the QM 100 Blocks magazine. Thanks for the chance to win. Love this block. This would make a great quilt for QOV. It's nice to see the block in the quilt. I would not have guessed where it was. It sure makes a nice table runner too!. Thankyou! I love your Red, White and Blue Yankee Doodle block. You can do so much with it. Thanks. I love the table runner using your block. Amazing. Wow! Your block makes an amazing secondary pattern. Great job! Your block was difficult to find. It is amazing when put together with others to form such an intricate pattern. I really like the table runner variation you show. Congratulations on your selection for Volume 7 of Quiltmaker's 100 Blocks. Your block is fantastic. You are crazy good! It is amazing that the block becomes all that and a bag of chips! Kudos for being included in the vol 7 issue. Your block should get an award of "betcha can't guess what I become!" Very clever block. I love quilts where secondary patterns emerge. This is a stunning block! Way cool - I tried to guess the block and was way off. I love how you created this block and the table runner would be a great one to make. Thank you for sharing and the chance to win. I couldn't guess what part of the quilt was your block. Wonderful how one block can make such a different quilt. Beautiful Block.. I can imagine it in red, white and blue.. Thanks for the inspiration and congrats on it being published in 100 blocks. That's a gorgeous block, very interesting. Congrats for making the magazine, well done. Thanks for the chance. What a great block! Thank you for the good instructions..
Love the opportunity to learn something new in quilt blocks! It's really amazing that the quilt is from just one block...congrats on being in the magazine! OMG what a block and what a fantastic quilt!! this is a must. thanks for the chance to win. Very tricky to hide the pattern so well! I like it! I always thought I was really good at finding the block in a quilt, but this one had me stumped. What a neat trick!! Love it! Thank you! Oh, I do like the wall hanging with the 4 blocks--like a radiating star or a supernova. Very creative. Wow! What a neat block! I looked for the block and thought I had it picked out only to see I was wrong. This is a block I will use for my QOV quilts. Congrats for having your block in Vol 7! What a wonderful block, I looked for it and couldn't figure it out. How much fun that will be to play with. I would never thing about doing a block like that, to get a beautiful quilt like that. I love the idea of your runner, perfect for the summer. I really really like your block - you make it sound so easy! LOL! Hi Barbara! Looks a tad complicated! Maybe it's just me not seeing it right! But your block is beautiful as always. Congratulations for it being chosen for the book! WOW! Love the layout of the block. Such a unique way to put it all together. Love it. What an interesting block. It certainly looks like it should be difficult. Lovely. What a neat block! Love the quilt it forms. Thanks for sharing it with us. love your rw&b block and the ways you've used it. marvelous! 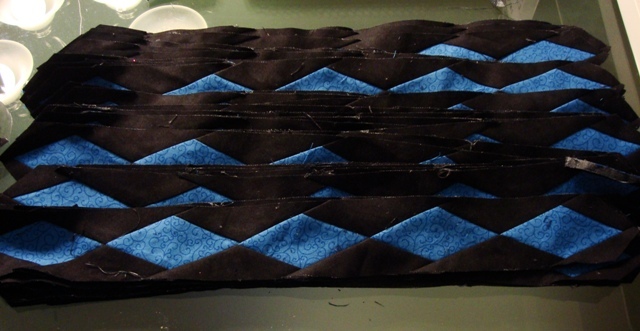 I love how your block is secondary to the quilt! It certainly is hard to pick out just the block! That really inspires me! Love your block. Wow! to how one block placed as you have can create such an awesome design!! What a cool block, and I cannot wait to see your new book! Barb ~ I LOVE your block. I am not sure which part is my favorite; the diamond chain, or the fact that it appears to be a very easy block to create with the end result being an amazing quilt. Beautiful work. Wow, I hidden block. It looks real great and I can not wait to get a chance to play with it. Thank you for a chance to win. Love love your block. Can't wait to get a copy of the magazine so I can make your block!! Congrats on being in Volume 7 of QM 100 Blocks magazine. All of the previous issues have been so inspiring to me. Thanks for a chance to win a copy. Love the block. I have to make this one. Your block is amazing - I couldn't find it. Congrats on having it appear in the magazine! And thanks for the chance to win. I just love your block! It it outstanding and congratualtions on being included in the book. Unbelievable! I would never have found the block. Fantastic! Very unique! Thank you for sharing & congrats on being in the 100! Very different and I love it! It makes me think of several ways to play with it. It will depend on how one positions the block. Wow! great block! I want to make it just to see the star magically appear. I like the patriotic colors you used in your block. Wouldn't it make a great quilt of Valor quilt? I like your block. Congratulations on having your block chosen. I love how this block goes together to make a stunning quilt! It is so interesting! Thank you so much for your ideas. Congrats on being published and thanks for the opportunity to win! Love your block. Looks a little hard for a newbie like me. Wow absolutely fasinating. good thing you showed us your block. What a stunning quilt! I can't wait to try this block. Hoping I can do justice to it. Thanks for sharing your talent with us! Way cool. I wouldn't imagined how versatile this block could be. Thanks for the demo. Amazing block - makes a wonderful quilt. Thanks. What an interesting block! Thanks for the giveaway. wow, what a fun pattern. And I like the look of your other quilts you have made. So glad your mother is brave, I haven't gotten as far as she has on the machine quilting. Your block is truly amazing! I would never have guessed looking at it that the outcome would be a quilt that had stars in it. This is one of the best blocks I have seen in this quilt along - so creative. 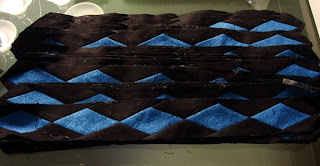 This is a wonderful pattern -- and so much easier than it looks! Thanks for sharing it with us! Congratulations for being published in Quiltmaker 100 Blocks Vol. 7! Your block is ingenious! There is no way I would have picked out your block from the quilt. I so want to win this magazine!! Wow! you can certainly design with vision. Very creative. thks. I love how this block works. Very creative! What a great block - I love it! love your block but a bit too detailed for me. I'm love star blocks, but simple ones like sawtooth star and ohio star. thanks for the opportunity to win. I like the diamond chain around the main block in the quilt. I have a pattern with the same style, sort of, but did mine by hand. What a nice way to use those little diamonds! I love the block! congrats for being in the magazine! Love the block, the wall hanging is a great idea. Wow--I never would have guessed that was the block!! Very cool! Now this is an ORIGINAL block! I love the results! Great block!!!! Don't know how you came up with this one but Thank You!!!! Wow, your block is very unique. Thanks for sharing. Great job! Thanks for sharing and for the giveaway! Oh I love that block! I have a lot of red/white/blue material and I was wondering what to use it in. I would like very much to be put in the drawing so I could get the pattern and start piecing! Beautiful design. I appreciate all the tips for assembly. Your block is beautiful. When I first saw it I thought it was two blocks in the quilt. Do you use a computer program to choose your colors and where they will go? Great job. NEAT block... I'd never been able to pick out the block. Love it! Wow, very impressive. I love it! The block is beautiful. I love the Nebula quilt--beautiful!!! Such a beautiful table runner version! So creative! Gosh I don't think I ever would have figured out the block! Love it. Impresionante este bloque. Nunca lo hubiera imaginado de esta forma. Felicidades por este gran trabajo. I would have never picked out that wonderful block in a croud. I totally love it. Didn't I just say you amaze me? Beautiful and fun! WoW! You are a smart cookie! How amazing! Your block is so neat and it looks great as a runner and quilt! Would be an awesome 4th of July runner. Congratulations on being included in this year's issue. Thank you and Quiltmaker for a super giveaway and a chance to win. That surely is an amazing block. Love it. I like the red, white & blue patriotic colors. Thanks for sharing and the chance to win. Nope, I did NOT see the block in the first picture! But it looks like a fun one to make, especially in the rwb scheme! WOW, what a unique block! Wow, that is so neat! Great block. That is awesome! Your creativity amazes me. Very clever design. I really like the chain around the block center.